Features: Perfect for indoor and outdoor use. Soft sponge covered handle grips for comfort and slip resistance grip. Thick carbon steel tube, super strong bearing ability. With it, you can easily exercise and train your body. Great for Push-Ups and stretching. Descriptions: S shaped bars, it is beautiful and practical. 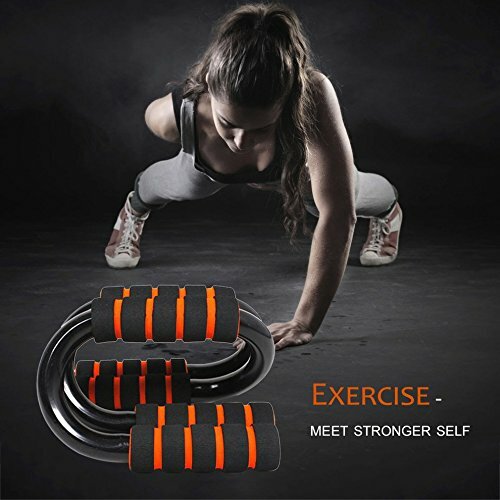 Improves strength in upper body, arms, legs and stomach. Lightweight for easy transportation. Specification: Material: carbon steel and sponge Color: orange & black Size: 12*12*12cm Package Content: 1 Pair Push Up Stands Sponge Hand Grip Bars Notes: Due to the difference between different monitors, the picture may not reflect the actual color of the item. We guarantee the style is the same as shown in the pictures. Thank you!